Need something to make your next Karuta match more exciting? Listen to this. 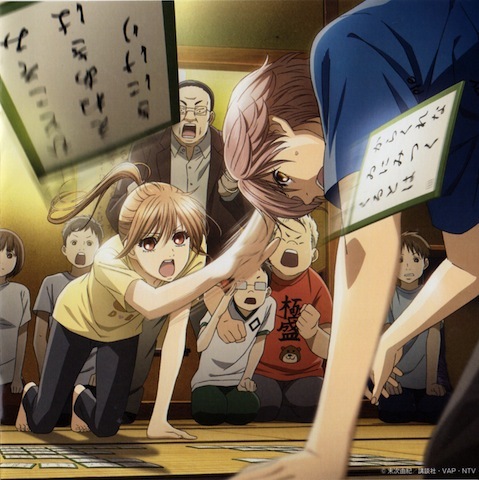 Those who are watching Chihayafuru already know that the music is one of the many great things this show has to offer. The series features tracks that add a lot of tension, often converting that built-up tension to a more positive emotional outburst. The Original Sound Track (volume 1) is available now, so it is time to start listening to it in earnest to see what makes it so good. Of course I can’t do justice to an anime OST review, so what follows is just me pointing things out until Anime Instrumentality gives you a proper review. [UPDATE: The review is now available]. My focus is going to be on the background tracks. The OP (by 99RadioService) and the ED (sung by Asami Seto, who plays Chihaya) are both pretty decent pop tunes, so you can consider them a bonus, if you don’t already have copies of them from their single releases. The “character” songs are not my interest; these three tracks are recorded by the voice actors who play Chihaya, Arata, and Nishida AKA Nikuman (“Meat Bun”). The character songs might have novelty value, but that isn’t what gets me jazzed about this album. 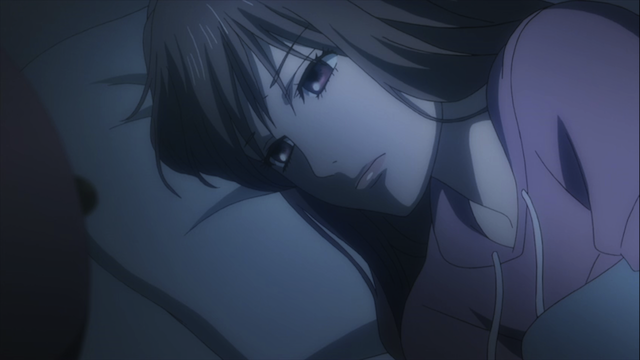 The background tracks (composed by Kousuke Yamashita) are a brilliant match to the emotional content of this show. Many of the tracks, as I said above, use the build-up of tension and ultimate conversion into a different mood as leverage to generate more energy than simply going to the positive emotion from the start ever could have. The Classical example of this has to be Beethoven’s final string quartet in which a dark question is posed (“MUST it be?”) and then emphatically answered (“It MUST be!”). With 20 tracks, I’m only going to give a sampling of what I am talking about, and this structure isn’t the only one that can be found in listening to the album, but I think it bears pointing out. This is a perfect example of what I am talking about. The track begins with a staccato monotone riff on the violins that is very tense and suspenseful, but by about 1:30 it develops into something exultant, with horns and harp sweeps. Here the emotional conversion is from sadness to happiness. It is like “hearing” tears turn into a radiant smile. The track starts off with a legato melody on the strings punctuated by “echoes” on piano then bells that almost seem to be the tear drops falling. The theme is then sensitively developed, until about 1:30 when a cymbal wash introduces a brass re-interpretation of the theme in a much more positive light. This one doesn’t quite follow the same structure, because it goes back and forth between a hesitant, introverted motif, and a soaring treatment of the full theme. It does demonstrate the basic idea of starting with one emotional idea and unexpectedly converting it to another to generate an even stronger impact than the second section could have on its own. Besides, its a beautiful piece, so listen and enjoy. This last track doesn’t quite fit the thesis I was building above, but it is a great track. The instrumentation is mostly percussive (especially in the beginning) and it is highly syncopated at times, which gives it a somewhat tense mood to start off with, but it develops into a great groove in the latter half, and ends up recalling some of the triumphal aspects of the Main Theme at the very end. All in all this is a great album. I hope you enjoyed what you heard here, and that you rush off to get a copy of your own. What do you mean you can’t do justice to an anime OST review? If you can’t do justice to this album, it’s only because the album is awesome, not because you can’t write awesome music reviews. Thanks, dude. It is true the album is awesome, but trying to write a review like this and reading the ones by folks who know how to talk about music (Anime Instrumentality FTW!) really gives me a feeling for my own limitations.